Harry Cook and Bennie Pete of the Hot 8 Brass Band. Photo by Elsa Hahne. 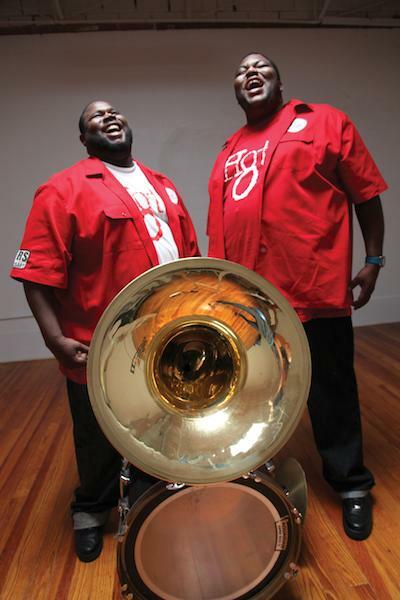 The indelible image of the Hot 8 Brass Band at a Sunday afternoon second line parade is that of sousaphone player Bennie Pete and bass drummer Harry “Swamp Thing” Cook. We picture them pushing the band’s low end up and down Lasalle through Central City, out North Broad Street or A.P. Tureaud in the Seventh and Ninth wards, under the Claiborne overpass, or, occasionally and to weapons-grade only-in-New-Orleans irony of juxtaposition, through the Magazine Street gelato district between Washington and Louisiana. Enormous, powerfully built men, Pete and Cook are the only ones who have stayed with the band since it formed in 1995. It’s easy to see them as uniquely capable of literally carrying the Hot 8’s slow, sticky groove on their shoulders all that time. Below the intricate ensemble parts and screaming trumpet solos lies a thick, muddy, rhythmic pocket. The low end is more P-Funk than Hey-Pocky-Way. 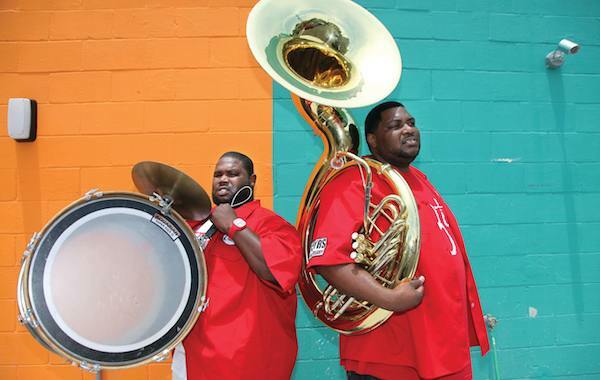 Even the standard brass bandleader’s call to action to begin a performance or end a break, the repeated ascending perfect fourth, sounds somehow deeper—nastier—on Pete’s asphalt-dented sousaphone as it rides through the city atop his massive shoulders. For years, it was the sound of Sundays on the New Orleans street. Lately, though, Sundays that find the Hot 8 on the second line route come fewer and further between. 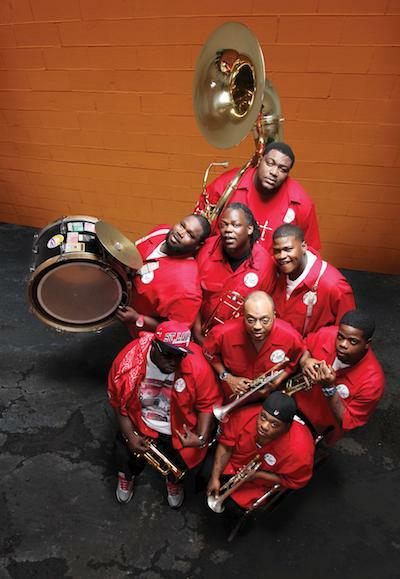 At a time when New Orleans brass bands are recommitting to their traditional roles at parties and parades, sometimes at the expense (intentional or otherwise) of recording and touring, the Hot 8 seems to be moving in the opposite direction. They keep a studio in Mid-City for twice-weekly rehearsals and weekly band meetings, but June, July, and August 2011, measured in dry-erase calendars on the wall, are covered with arrows and destination states, cities, and nations, not showtimes at New Orleans venues or the names of the social aid and pleasure clubs that used to hire them. The band has been on the road this year, as often as not. “We ran the streets for years,” Bennie Pete says, but when the Stooges Brass Band bested the Soul Rebels along with the younger To Be Continued and Free Agents brass bands in the Red Bull-sponsored Street Kings competition underneath the Claiborne Avenue Bridge in October 2010, the Hot 8 wasn’t in the tournament. Their high-profile club show during this year’s Jazz Fest was at the Howlin’ Wolf with Mos Def, and they spent the spring touring with Lauryn Hill, first as her opening act and then as her horn section. The Hot 8’s hybrid of funk and reggae was a natural fit with Hill’s repertoire, and for much of the band just meeting her was thrilling: When Pete talks about “just hanging out with Lauryn Hill” in a conversation where he also casually mentioned Spike Lee and Mos Def, you can hear the italics. Still, the rigors of a high profile tour, combined with the rehearsals that the notoriously perfectionist singer had a habit of calling on off days and in the middle of the night, can take a toll. That might not change any time soon because the Hot 8’s ambitions see far beyond the city limits. Their first studio CD, Rock With the Hot 8, came out in 2007 on Tru Thoughts, an independent UK record label, where their labelmates are primarily European club and downtempo DJs and which made them, in 2009, surely the only New Orleans brass band with a full-length, digital-only album of their own tracks remixed by European club and downtempo DJs. Tru Thoughts will release their next CD in early 2012. Harry Cook laughs at a question about where the band is going from here. “We done been all over the world,” he says. “Playing on Mars? That would be cool, but it’s hard already to play in Colorado, Telluride—high altitude.” It’s all a long way from the meeting room at A.L. Davis Park at the corner of Washington and Lasalle, where the band practiced every day after they left Alcee Fortier High School. “When we home,” Pete tells me in a phrase he’s used to begin three consecutive sentences, one that speaks volumes about a touring band’s relationship to its hometown, “we want to play some gigs, stay in tune with the streets, stay in tune with the city. But if we don’t do the second line, then we not really mad like we used to be.” Coming home is a way for the band to reconnect and collaborate, and sometimes to inaugurate new recording projects. 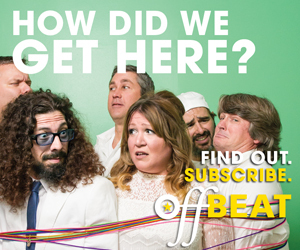 In the big picture, there are musical, promotional and financial opportunities out of town. 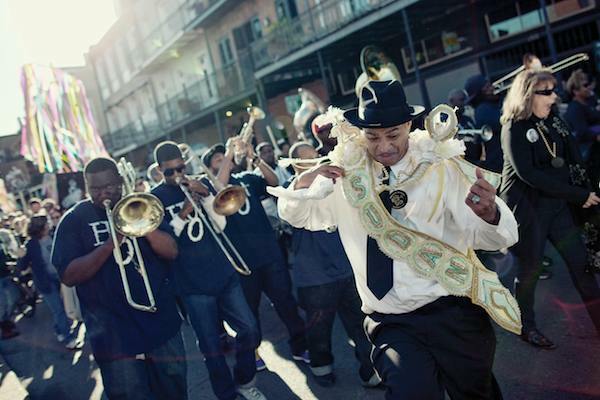 Success, the story goes, means not just money or fame but a ticket out of the impoverished neighborhoods and imperiled communities that are the cradle of and proving ground for so much of America’s music, and where Cook calls his bass drum the motor that drives the second line parade. Playing up to five gigs a day on weekdays and 10 or 12 on weekends in New Orleans is the way to hone a musician’s chops, and success means being able to settle down somewhere else. It means access to well-appointed clubs in New York and Paris and high-priced jazz festivals in little resort towns, where musicians are compensated properly for their art and sacrifice. The heroes return once or twice a year, say all the right things about their hometowns, and are met with adoring crowds and fawning press attention at Jazz Fest and Mardi Gras, whereupon they return to comfortable lives in more comfortable cities. This is not the story of the Hot 8 Brass Band. Hot 8 Brass Band leading a second line. Photo by Pompo Bresciani. For the five years since the national spotlight found them featured prominently in Spike Lee’s HBO documentary When the Levees Broke, the Hot 8 has been a convenient metaphor for the post-Katrina city: in the face of unthinkably difficult circumstances, the band has persevered and endured. That much is undeniable. 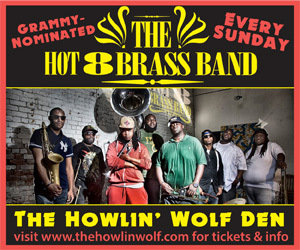 In 1995, members of the Looney Tunes and High Steppers brass bands merged to form the Hot 8. In 1996, trumpet player Jacob Johnson was murdered in a home invasion. He was 17 years old. In 2004, trombonist Demond Dorsey died of a heart attack at the age of 28. On August 3 of the same year, trombonist Joseph “Shotgun Joe” Williams was shot dead by NOPD officers who said he was using the pickup he was driving as a weapon against their police cruiser. He was 22 and (save for the truck) unarmed. Just under 13 months later, Hurricane Katrina devastated New Orleans. In April of 2006, on a trip to Atlanta to visit family who had relocated after the storm, Hot 8 trumpeter Terrell “Burger” Batiste got out of his car to fix a blowout by the side of the highway. He was hit by a car and lost both his legs. Thankfully, Batiste is an instance of the band’s perseverance and endurance, not a tragedy they’ve endured together. He returned to the band’s lineup at Jazz Fest 2007, and he started riding in a wheelchair for the band’s second line gigs. When the Hot 8 performed at the Jazz Foundation of America’s 10th annual “Great Night in Harlem” at the Apollo Theater this May, Batiste walked onstage with new prosthetic legs. When school started in August 2006, Hot 8 snare drummer Dinerral Shavers began working as a substitute French teacher at then-newly-reopened L.E. Rabouin High School in the Central Business District. By the end of the fall semester, he had started a marching band at the school and become its director. After the exposure of When the Levees Broke, the Hot 8 was a full time job for most of Shavers’ bandmates, but he had always wanted to be a marching band director and was excited at the opportunity that the school district’s post-Katrina confusion afforded him. On December 28, 2006, Shavers was killed in his car in a turf war-related shooting whose target, police speculated, was Shavers’ 15-year-old stepson. Dinerral Shavers was 25 years old. Bass drummer Harry Cook and sousaphonist Bennie Pete. Photo by Elsa Hahne. The tragedy brought their lives and hometown into relief for the Hot 8, and in many ways continues to inspire and propel the ambition that’s taken them away so often. Shavers’ funeral was recreated earlier this year, for HBO’s Treme. In an emotionally wrenching scene featuring his younger sister Nakita’s heartbreaking speech, Bennie Pete leads brass musicians from all over the city out of the church into the funeral parade. After declining to appear in the show’s first season, the group took this storyline as a way to tell their friend’s story. Pete is careful to emphasize that they had permission from Shavers’ family. “We saw it as an opportunity to let the world know who Dinerral was,” he says. They have been singled out for their music and their story, but the Hot 8 are not uniquely visited by tragedy, nor are they victims of some kind of anomalous bad luck. Over the years there have been jokes about the “Hot 8 Curse,” but there’s nothing supernatural at work. Where their community is concerned, they are sadly normal, and the matter-of-fact tone with which they all describe their friends’ deaths into a stranger’s recorder indicates that reality. Pete points out that the Lil’ Rascals Brass Band, an early inspiration for the Hot 8, also lost four members to early deaths. Brass band musicians are, for the most part, African-American men, and in New Orleans like in much of urban America, that’s its own hazard. The band members all know. Their increased touring schedule and time away from New Orleans is, at least in part, “Bennie’s way” of protecting them from the city with the highest murder rate in the U.S. The Hot 8 has turned music, which they identify as their most effective tool, to the task of helping its city. The band became and remains active in the Silence is Violence organization that grew up out of the violent winter of 2006-07, dedicated to helping citizens and public officials work to make the city safer, and with Save Our Brass, which supports and supplies Katrina-displaced brass bands and brass musicians with funding and, initially at least, with instruments to replace the ones they lost. On the road, the Finding Our Folk Tour put them in front of displaced New Orleans audiences in an effort to reunite communities of what the organization calls the Gulf Coast diaspora. Music and music education, Pete says, are crucial to the social reform he imagines. Traveling and performing in schools across the nation, he’s seen the resources that other school-age musicians have at their disposal, and he knows they’re missing from music classrooms in the birthplace of jazz. Together with Dr. Michael White, the Hot 8 performed at the Bywater’s Sound Café in a series of workshops designed to teach young New Orleans musicians about the city’s jazz tradition, and they incorporated his lessons about music theory, history and the traditional roles of the brass band instruments into their approach to the repertoire, from traditional music to their own compositions and the contemporary songs they cover. Their refined approach and their connection to White opened doors at jazz venues and festivals all over the globe. The Hot 8 recorded the tracks for its second CD in Boston and New York; they did vocal and percussion overdubs in New Orleans. It’s mixed and mastered. If it were on tape, it would be in the can. The cover art is ready. Self-released or on a local record label, it would be on shelves this fall when the second-line parades return and New Orleans emerges from summertime’s reverse hibernation. Across the Atlantic, Tru Thoughts’ release schedule has other priorities, and the wider market the label delivers has other demands. In addition, when he sat down with me, Bennie Pete was struggling with the label’s request that they return to the studio to add a traditional New Orleans song. All the rest of the tracks will be Hot 8 originals. After all the ways the Hot 8 have pushed their music, it’s a little surprising to hear that Williams still aims his music at the ground that’s no longer even beneath his clean white sneakers. What about the next step, the sky, the Martian audience whose thin air worries Harry Cook? Bennie Pete, the bandleader and member most active and invested in what he calls “building the brand,” agrees with Williams. “A lot of the bands are looking for a new sound and new direction,” he says of their latest recording project. “But this is not that CD. This CD is kind of right here at home. It’s for the home team. People can relate.” Hot 8 performances may have moved away from the streets themselves, but the music stays in touch with where it started. This is a rich and so well-written piece–wide ranging, erudite, and also moving and personal. Enjoyed it very much. As my dad said about Rick James, if he he hadn’t lived through those things, as terrible as they might have been, he probably wouldn’t have been able to make the music to sound the way he did.